So, the sorry saga continues. 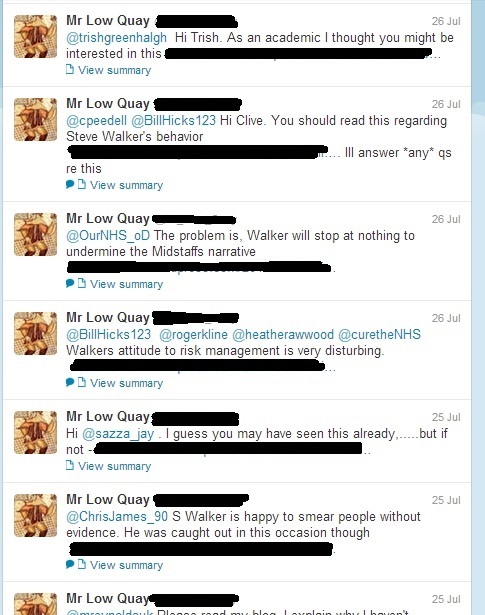 As I wrote the other day, the loathsome blackmailer ‘Loki’, who tried to coerce a university into stopping one of its students from arguing with ‘Cure the NHS’ on Twitter by revealing a spent criminal record and threatening to go to the newspapers if the student wasn’t silenced, appears to be one ‘phyllisstein2’ – a mentally-ill woman diagnosed with Munchausens by proxy. If you want to see how her admission of sending the blackmail message exactly matches Loki’s claims, see this article and this one. 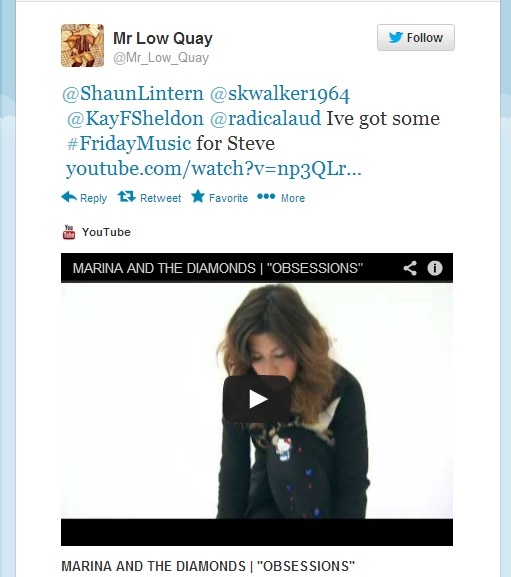 (It was never a ‘safeguarding issue’, as the blackmail email made perfectly clear, but note the ‘Doesn’t she claim’). 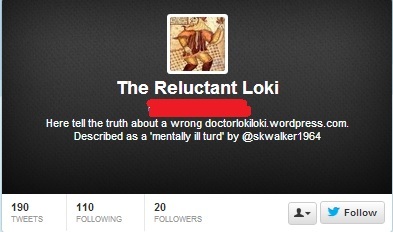 I blocked Loki on Twitter (she’s started following my blog today, so hi Phyllis), but she has apparently been issuing certain challenges to me that bear a brief response here as a counterbalance to the weird, defamatory campaign and because they shed an interesting light on the mindset and tactics of some Cure supporters. And then I hope to consign her entirely to the dustbin of ‘people you’d rather never have encountered’. As you’ll see, no reference to ‘mentally ill’, nor would there be, since I take a particular interest in mental health issues and believe that mental illness should not be stigmatised. As in so many things, ‘Loki’ has to conflate completely separate issues to try to make her point. When she got the ‘Loki’ account temporarily suspended for abusing it by sending dozens and dozens of unsolicited messages to other people about me, she then created another account, calling herself ‘Mr Low Quay’, to continue stalking and harassing. For which I’m thankful. Most have simply ignored her, which may be the wisest course. Anyway, that’s enough background to give you a fair idea of what’s going on. I am aware of Cure The NHS and feel sorry for anyone who has lost a loved one but I could in no way considered to be a supporter.I am aware of Cure The NHS and feel sorry for anyone who has lost a loved one but I could in no way considered to be a supporter. you tried via the comments on my blog to claim that the letter didn’t exist, because you knew it was an email and were splitting hairs. At that point, I didn’t know that, so based my comments on it being a written letter. I’m not interested in hair-splitting. Letter, email or smoke-signal, it was vile, cowardly and beneath contempt. That will have to satisfy you, because you make me want to be sick and you’re a coward who tries to use some supposed danger to excuse your use of a pseudonym in order to make vicious, craven attacks on people who are unable to defend themselves. As you can see, I don’t fall into that category, and I consider you beneath contempt and your points not worthy of fuller discussion. 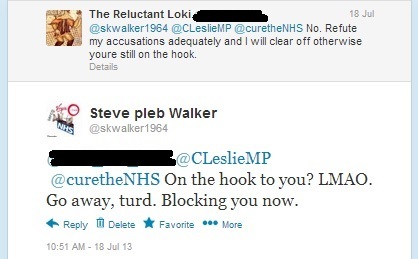 Loki’s behaviour is an extreme, to be sure – but still on the same spectrum as the mobbing, threatening, bullying response with which Cure the NHS responds to any criticism or dissent. In that regard, at least, it serves a purpose – and if you consider I’m being unfair to them, a reading of the timelines of members and supporters, or that of anyone who ventures to disagree with them, will soon put you straight. Ms Bailey claims to have been hounded out of Stafford, but to those unfortunate enough to be acquainted with Cure’s tactics, it’s clear that the ‘hounding’ goes in only one direction. The escalation of that against me, and against others, since the truth about Mid Staffs went mainstream for the first time last week, makes it more obvious than ever. 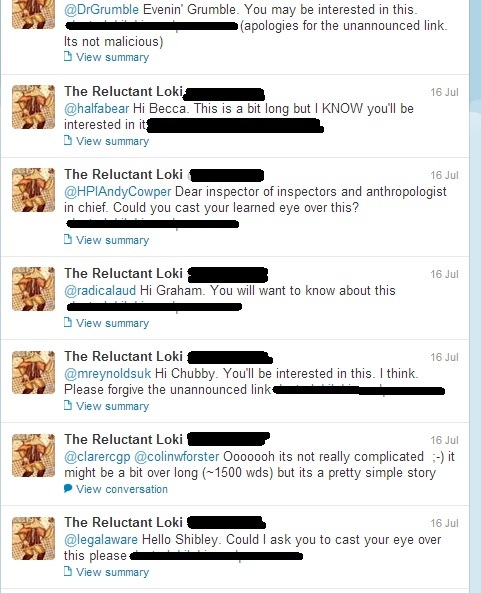 The Cure campaign bears many resemblances to the campaign that lasted many years against some of the paediatricians in Stoke (the main difference being the scale of the target) – could Loki have been associated with that? It wouldn’t surprise me, but I have no evidence either way! Steve. As I said before, keep going mate. Your posts do more to support us in/and the NHS! No, I didn’t think it would! 🙂 Thank you very much. Lets hope that this brings an end to this sorry saga of harrassment. Its felt exhausting just reading about it so I can only imagine the toll its taken on your life, Steve. Many people would have given up under such an attack and I’m glad you’ve stayed the course otherwise a valuable contribution to the truth about what is happening to our NHS would have been lost.You’ll always have my support for bringing that into the light, Steve. Thank you – it means a lot! Here, here – Steve’s been a rock! I’m sure they won’t but don’t let them grind you down – your blog helps to counter the barrage of spin put out by the MSM. As another poster said keep the good work. Why would every hospital follow the directives of removing vases and only ONE WARD in the country go against the directive?? This is one evil twisted women who can put herself before the good of her community and thanks to her efforts Stafford is in danger of closing.. No wonder the people of Stafford hate her I would too if I lived there. Keep up the good work Steve.. Thank you! Yes – if only journalists asked those sorts of obvious questions when they’ve interviewed her! It’s quite remarkable that Julie sticks to this debunked story – that shows to me that there’s more calculation to this than I previously thought – that or a loss of any touch with reality. I think Cure et al had better check the law on harrassment, which applies to groups as well as individuals. I intend taking this all the way through legal channels – the police are now involved. Great stuff. I’m just waiting for some legal advice so may well be joining you very soon! Don’t know whether you noticed our pal ‘chubby’ and his ‘contribution’ today, but it was about typical. 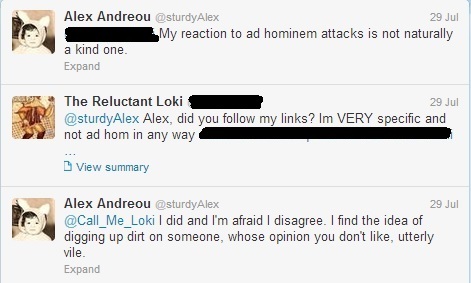 I think it honestly hadn’t occurred to him that there’s more than one stream of harassment going on here. Bless – he’s a bit challenged in the braincell department. Oh yes, I agree about Chubby. I’m staying off Twitter generally so haven’t read specifics, but he does chunter a lot of nonsense. I told this individual that the statements re. you and the student were lies, and was invited to read the blog and ask any questions if I needed more “information”. I don’t. I have a lot of sympathy for people who have mental illness, and I’m beginning to think that this person may be a sufferer – the behaviour is obsessive and very odd. It could be forgiven if there was a bit of honesty and if it wasn’t causing so much damage – but it is, and even ill people have to take some responsibility for what they do unless they are diagnosed as completely psychotic and out of touch with reality. I doubt that’s the situation here. You are doing a sterling job; it’s difficult enough to put your head above the parapet the way you do, and I daresay doing this will attract a few odd people now and then. But this is harassment and bullying of the worst kind; it seems that the holier-than-thou people in JBs entourage have a similar tendency to be a bit like this too. Disgraceful. Soldier on, Steve, You’ll be in my thoughts and meditations. Thank you! I’d noticed you taking issue with our ‘friend’ and really appreciate it! By the way – here we are at 7pm and nothing from the sainted one re. the closure of acute services at Stafford. We’ve been nattering about this at flythenest. Something. It appears ‘Phyllis’ is planning something against me, too. Good on you – let me know how it goes!